We are here with our take on your favorite summertime recipes. Strain lemon juice through a nice sieve into a pitcher. Add sugar, stirring until it dissolves. Stir in water. Muddle lemon, ginger, mint and honey in a glass. Stir in water. Top with crushed ice. Prepare an ice-water bath. Fill a large pot with two inches of water, and set a steamer basket (or colander) inside. Bring to a boil. Place green and wax beans in the basket, and reduce the heat to a simmer. Cover the pot and steam until the beans are bright and crisp (about six to eight minutes). With tongs or a slotted spoon, transfer the beans to the ice bath to stop the cooking, then drain. In a medium bowl, whisk together mustard, vinegar and oil, and season with salt and pepper. Add the steamed beans, and toss to coat. 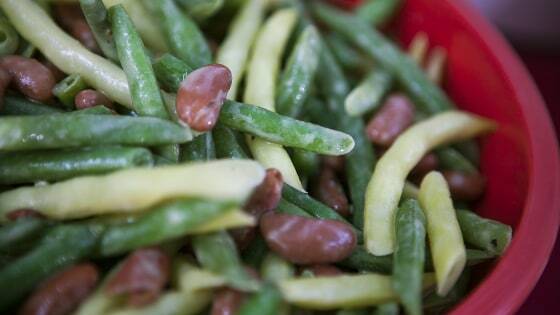 The bean salad can be refrigerated, covered, up to 1 day; bring to room temperature before serving. Whisk together cornmeal, flour, sugar, baking powder, one tsp. salt and one tsp. pepper. Stir in eggs and milk. (You will have about 5 cups of batter). Fill a large, heavy pot, Dutch oven or deep fryer with enough oil to submerge hot dogs, then heat until a deep-fry thermometer reaches 360 degrees. Meanwhile, pat the hot dogs dry, and insert a 10-in. bamboo skewer through each lengthwise. Roll them in flour to coat. Dip one hot dog into batter, turning until completely coated. Let any excess batter drip off, and wipe away extra batter using your fingers so that the hot dog is coated evenly. Lower hot dog into the hot oil. Immediately repeat with 2 hot dogs. 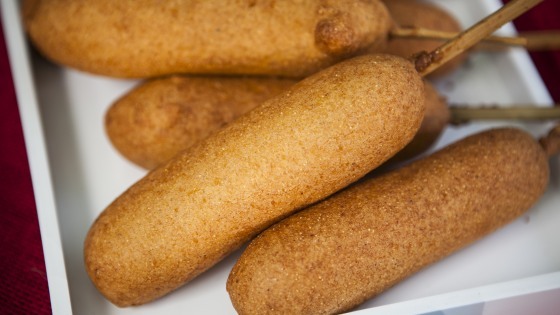 Cook corn dogs, turning to cook evenly, until a deep golden brown (about 5 to 7 minutes). Transfer to a tray lined with paper towels, turning to blot the oil. Working in batches of 3, repeat the process with the remaining hot dogs and batter. In a medium bowl, stir lime juice and water into the refried beans, and season with salt and pepper. Transfer to a serving dish. 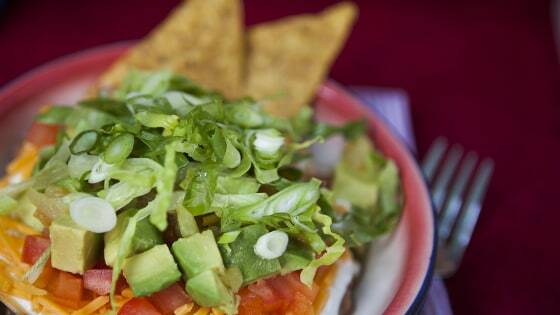 Spread the sour cream on top, then layer evenly with cheese, chiles, tomatoes, avocado, lettuce and scallions. Serve with tortilla chips. In a large saucepan, cover potatoes with water by several inches. Bring to a boil, then add 1 tbsp. salt. Reduce heat and gently boil until potatoes are tender when pierced with the tip of a sharp knife (about 25 minutes). Drain. Peel the potatoes while still hot — using paper towels to protect your hands — and cut them into 1-in. pieces. Transfer potatoes to a bowl and drizzle with vinegar. Let cool. Place the eggs in a small saucepan, and fill with enough cold water to cover them by 1 inch. Bring to a boil, then turn off the heat. Cover, and let stand for 11 minutes. Transfer to a bowl and cover with cold water, then let cool and peel. Cut the eggs into 1/4-in. dice. Slice the remaining egg into 1/4-in. thick rounds, reserving for garnish. 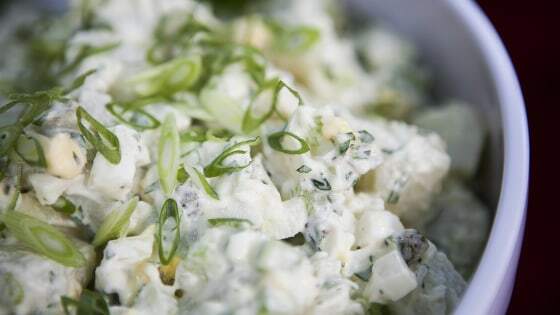 Combine diced eggs, mayonnaise, celery seeds and dry mustard in a large bowl. Season with salt and pepper, and whisk to combine. Stir in potatoes, celery, onion, cornichons, scallions and parsley. Refrigerate at least 30 minutes, or up to 1 day. Just before serving, garnish with paprika and egg rounds. Preheat oven to 450 degrees. In a medium bowl, combine cherries, sugar, flour, cornstarch, lemon juice and zest. On a lightly floured surface, roll one disk of dough out slightly less than 1/8-in. thick. Use a 4 3/4-in. cutter to cut out 6 rounds. Fit rounds into 3 1/2 in. fluted tart pans with removable bottoms. Divide filling evenly between pans. Roll second disk of dough out 1/8-in. thick. Use a small star-shaped cutter to cut out dough stars. Place them on top of the filling. Put onto a parchment-lined baking sheet. In a small bowl, whisk together egg and heavy cream. Brush evenly over the tops of the pies. Bake until golden brown, and juices are bubbling (35 to 40 minutes). Remove from oven, and let cool for at least 1 hour before serving. Cook's Note: After 30 minutes in the oven, the crust will turn light gold and the berries will start bubbling. Although the pies may look done, they need to bake for another 30 minutes to ensure that the bottom crusts are cooked through. Preheat oven to 425 degrees. Gently toss blackberries with sugar, cornstarch and salt in a large bowl. On a floured surface, roll 1 disk of pate brisee to 1/8-in. thickness. Using a 5 1/2-in. biscuit cutter, cut out 6 rounds. Drape each round over a 4-in. fluted tart pan with a removable bottom, and press dough into bottom and up sides of pan. Edges with be flush with rims. Roll remaining disk of dough to 1/8-in. thickness. Cut out 6 more 5 1/2-in. rounds. 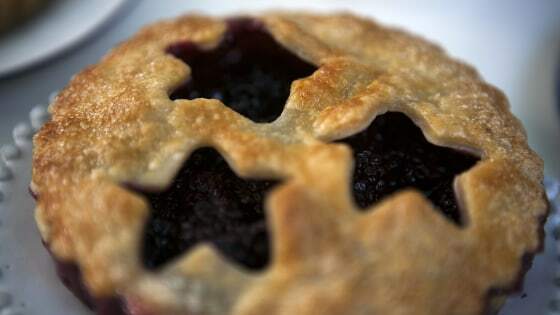 Fill each tart pan with 3/4 cup blackberry mixture, mounding berries in the center. Dot berries with butter. Center 1 of the remaining dough rounds on top of 1 tart pan. Using a small star-shaped cutter, cut out star shapes from the rounds. If making with the individual cherry pies, you can use these dough stars to put on top of the cherry pies. Gently press top and bottom edges of dough together to seal, and the pinch sealed edges. Repeat with remaining rounds. Transfer pies to a rimmed baking sheet, and freeze or refrigerate until firm (about 15 or 20 minutes). Lightly whisk yolk and heavy cream in a small bowl. 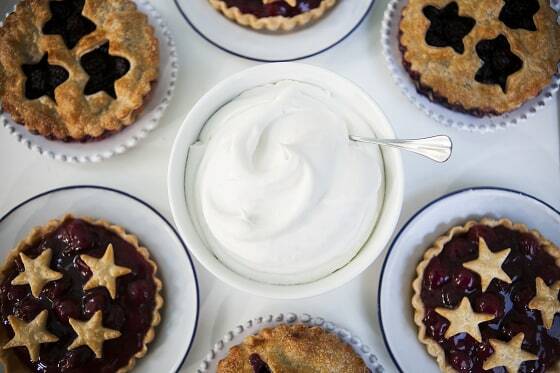 Brush the top of each pie with egg wash, and sprinkle with sugar. Cut 4 vent holes in the top of each with a paring knife. Bake for 30 minutes. Then rotate the baking sheet, and reduce heat to 375 degrees. Continue to bake until berries are bubbling and crust is deep golden brown (about another 30 minutes). Let pies cool in pans on a wire rack for 30 minutes. Unmold, and let pies cool completely on wire rack. Serve with whipped cream.